The corporate media is getting all giddy and affording blanket coverage to the story of Iraqis who are “regaining their sovereignty” as U.S. troops are pulled out from Iraqi cities. This is of course lurid and baseless propaganda – hundreds of thousands of U.S. troops will remain in Iraq stationed at the dozens of military bases that have been built across the country. 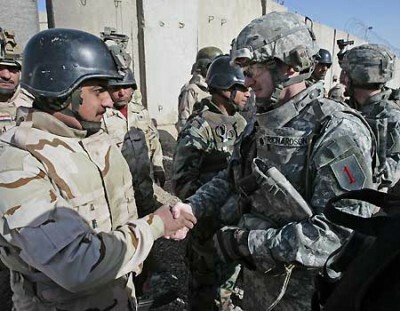 “As of now, there are approximately 130,000 U.S. military personnel in Iraq. Most of the U.S. soldiers that had been deployed in Iraqi cities are being returned to garrison elsewhere in country. The United States Air Force controls Iraq’s airspace. The United States Navy controls Iraq’s territorial waters,” points out the Cryptogon blog. After the “official” full withdrawal date of 2011, which Admiral Mike Mullen has indicated isn’t even guaranteed, “Mr. Obama plans to leave behind a “residual force” of tens of thousands of troops to continue training Iraqi security forces, hunt down foreign terrorist cells and guard American institutions,” reported the New York Times back in February. “Residual force” is a euphemism for “occupying army,” since only the most stupidly naive could ever believe that Iraq is now nothing more than a subservient client state of the new world order empire. A senior military officer spelled it out more plainly to the Los Angeles Times, “When President Obama said we were going to get out within 16 months, some people heard, ‘get out,’ and everyone’s gone. But that is not going to happen,” the officer said. Indeed, at the last count which took place nearly three years ago, the U.S. military had already built no less than 55 fully functional military bases in Iraq, with funding in place to build many more. Furthermore, U.S. troops aren’t even leaving the cities altogether. Reports confirm that U.S. tanks will continue to patrol the areas outside of the “green zone” and the airport in Baghdad. The streets of major cities will still be patrolled by U.S.-trained Iraqi soldiers manning checkpoints everywhere harassing people for ID. In addition, if the Iraqis “request help” from U.S. troops to undertake security procedures, they’ll be right back on the streets just as before. Iraqis themselves are not fooled by the charade. As the New York Times admits, the “celebrations” today “seemed contrived”, “Police cars were festooned with plastic flowers, and signs celebrating “independence day” were tied to blast walls and fences around the city. On Monday, night a festive evening celebration in Zahra Park with singers and entertainers drew primarily young men, many of them off-duty police officers,” according to the report. According to Websters dictionary, “sovereignty” is defined as “freedom from external control”. Anyone who believes that Iraq is a sovereign country and has “freedom from external control,” or will ever achieve it while hundreds of thousands of U.S. troops are stationed at dozens of bases throughout the country, probably still believes that Saddam was hiding weapons of mass destruction.